Dylan’s on his way – are you ready to play? 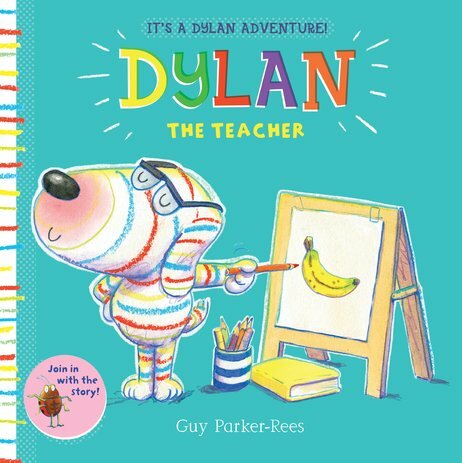 DYLAN THE TEACHER is the third picture book in a series featuring an exuberant stripy dog, who just loves to play. Created by bestselling illustrator Guy Parker-Rees, Dylan is a joyous new character who uses playing and fun to help toddlers explore and understand their world. Today Dylan is playing at being a teacher. But being a teacher isn’t as easy as it looks. There are quite a few disasters – and a splosh in the river – before Dylan finally discovers what he’s good at teaching: his Cheery-Warm-Up Song and Dance! Look out for Dylan’s friend, Dotty Bug, on every page, as she encourages readers to join in with the story.